Militants attempting to carry out a suicide attack using vehicle and motorcycle explosive attacks. Afghan officials seized one vehicle and three motorcycles. In addition, they seized several suicide vests, a rocket launcher, and several other weapons. Intelligence experts stated that the attackers were planning on attacking presidential campaigns in the city of Lashkargah. Over 113 people were injured in what police are calling a terrorist attack at the Kunming Railway Station in Yunnan Province. At least 5 assailants were shot by police at the scene. No groups have claimed responsibility at this point. Police Investigate crime scene at railway station. To break up brawls from hikers on the slopes of Mt. Everest, security forces are being deployed by Nepal. 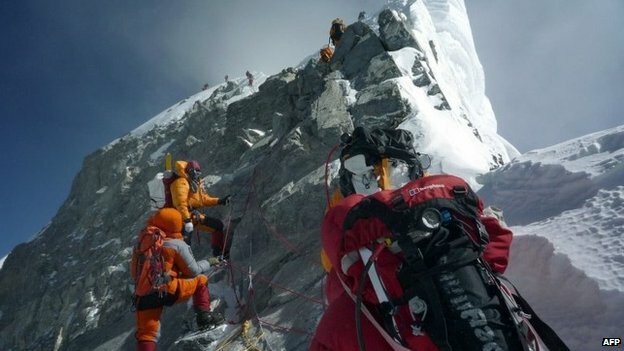 Last year at 24,508 ft (7,470 m) a fight broke out between sherpas and a group of European mountaineers. And the trend is that this mountain will continue to become more crowded as more and more are looking to add to the elite group of people who have scaled this summit (over 3,000).